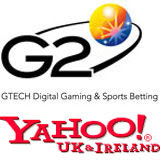 Gamblogger: GTECH G2 Renews Agreement to Supply Bingo, Poker & Games to Yahoo! GTECH G2 Renews Agreement to Supply Bingo, Poker & Games to Yahoo! GTECH G2 will continue to provide bingo, poker and games to search and entertainment giant Yahoo! for at least another two years. New instant win games will be added to the state of the art games powered by GTECH G2. Yahoo! Bingo, first launched in 2005 by St Minver for Yahoo! UK & Ireland (http://www.yahoobingo.net/), includes bingo and a selection of more than 60 instant-play games including arcade games, scratch cards and number games which have been extremely popular at the entertainment portal. The top games include Monopoly, Cluedo and Dynamite Idea's market leading Triple Chance High Low. Yahoo! will now be among the first to feature GTECH G2’s new “instant win” games channel through St Minver. This exciting new “Instant Win” channel combines best of breed arcade games, scratchcards, table games, progressive jackpots and branded content aimed at casual gamers. The Instant Win solution offers a fully outsourced, white label solution for brands and gaming companies wishing to extend life time values whilst offering entertaining content. Yahoo! will also now launch download poker to complement its current Flash poker offering. Yahoo!’s poker room (http://uk.poker.games.yahoo.net/) is part of the International Poker Network (IPN) powered by GTECH G2. One of the largest independent poker networks in Europe, the IPN recently celebrated its three-millionth player. Yahoo! provides interactive tutorials and presents free poker tournaments.